Astronaut Edward H. White II floats in space during America’s first spacewalk. In this historical photo from the U.S. space agency, Astronaut Edward H. White II, pilot for the Gemini-Titan 4 space flight, floats in space during America’s first spacewalk. 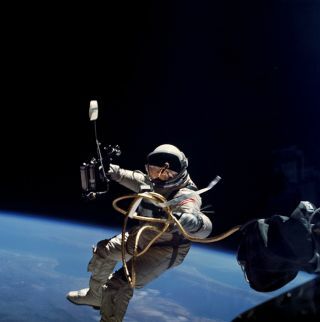 The extravehicular activity (EVA) was performed during the Gemini 4 mission on June 3, 1965. White spent 23 minutes maneuvering around his spacecraft as Jim McDivitt remained inside the spacecraft. White is attached to the spacecraft by a 25-ft. umbilical line and a 23-ft. tether line, both wrapped in gold tape to form one cord. In his right hand, White carries a Hand-Held Self Maneuvering Unit (HHSMU), which he used to help move him around the weightless environment of space. The visor of his helmet is gold plated to protect him from the unfiltered rays of the sun.